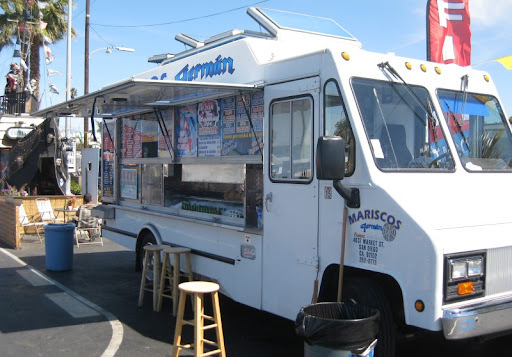 I'd heard that a new Mariscos German truck recently starting operating in Ocean Beach, so we went to check it out today for lunch. It is parked in the lot of the Apple Tree market off Cable Street between Newport and Santa Monica. They have a nice little seating area behind the truck. Emphasis on "little", though - it is just a single table with a few chairs so you need to be lucky to get a seat. We weren't lucky, so we enjoyed our lunch curbside. 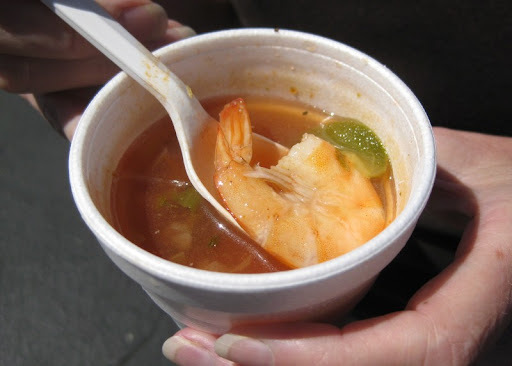 As is the case with the other trucks, when you order they give you a cup of fish soup with a shrimp in it. Unlike the soup I've had at the University & 35th truck, this shrimp came sans head. Maybe trying not to freak out the beach folk? The University truck (which I've heard has been sold, although it currently maintains the same name) currently charges $.75 for the soup, but I saw no mention of a price at the OB truck. Regardless of price, it makes for a perfect snack while you are waiting for the rest of your food. I found it a wee bit salty (and I'm a salt fiend), but the texture was fantastic - particularly the octopus. It was definitely the best thing we had. It ended up being a bit more food than we could eat. The tostada was huge, and their tacos are also very big. Personally, I would prefer it if they made them a bit smaller. They would be easier to eat, and I could have more variety without stuffing myself to the gills. As complaints go, however, that's a pretty minor one. 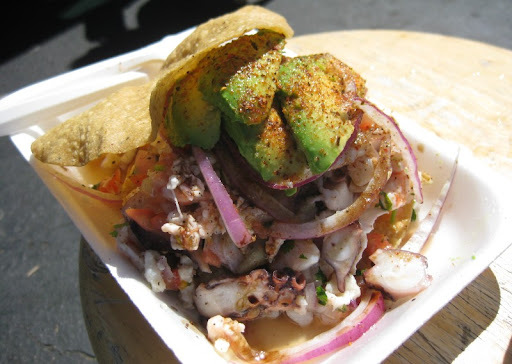 All in all, the Ocean Beach truck is the same Mariscos German experience in a more convenient (for us, at least) location. It's going to be a great place to get a bite to eat before or after a few beers at either Newport Pizza or the new Ocean Beach Pizza Port. My mouth is watering... MG a long time favorite of mine glad to see they are in OB. I think they will do well their. Sure beats overrated South Beach Bar and Grill. Now the locals will get a taste of some real tacos. Great Pics! We discovered this place two weeks ago, and we've been back for lunch every day since. Incredible food, especially the octopus tacos. 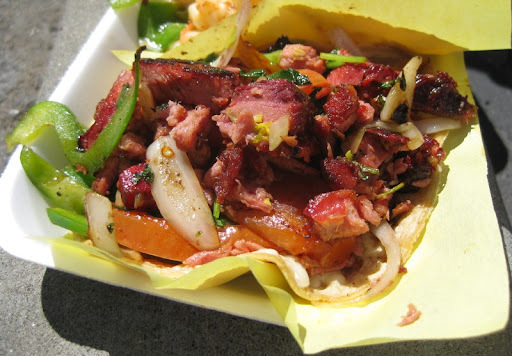 Hi Andy - I've enjoyed the octopus taco from the University truck, and I'm looking forward to trying it at the OB location. Hey Mike - I think one of the best items that MG makes is the Aguachile, the marinated raw shrimp.... I also think their Gobernadors are among the best I've had. Hi Kirk - I haven't tried the aguachile yet, but I definitely plan to. Hi Mike, I know what you mean about the sizes of these.. I really enjoy the shrimp tacos. What a great addition to OB! Dennis - yeah, the size is definitely a challenge. You have to eat through some of the contents first before you even think about picking it up and eating it like a normal taco. They do serve them with a fork, though, which I guess can be taken as fair warning. 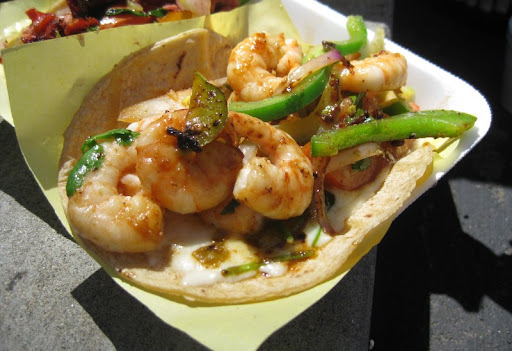 Those shrimp tacos look divine! I've been meaning to visit one of the trucks but this these photos may just be the incentive I needed to go and do it. Germaaaaaaaaan, eres el de San Felipe ?? 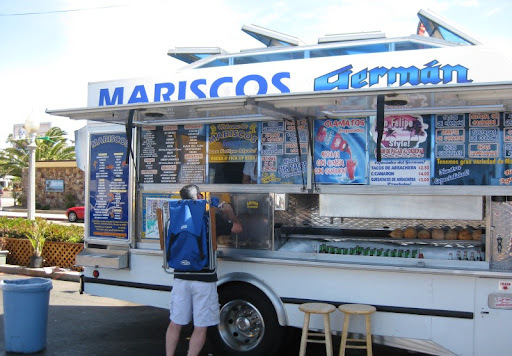 The city is now trying to close down Mariscos German taco truck, as well as the neighboring florist and coffee shop that dwell in the Apple Tree parking lot. In the city's eyes, Apple Tree didn't get building and signage permits for the three additional structures on their parking lot. According to Thyme Curtis from Councilman Kevin Faulconer's office, Lisa Johnson from the city is handling the permit appeal process. Yeah, I saw that chowhound thread. Hopefully something can be worked out. Finally made it to this truck yesterday. The fish taco was awesome. Ordered the ceviche, too, and like you thought it had good texture, but was too salty. Great lunch for under $4.00. I forgot they gave you the small soup with your order. When I was handed the soup I thought it was a ceviche sample and promptly spilled half on my hand leaving a nice burn. I love food wounds. 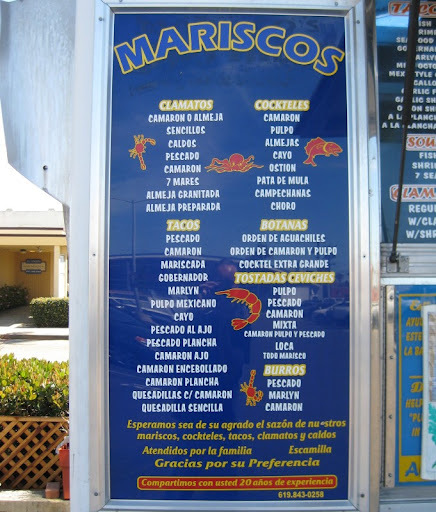 I am very disappointed to see that Mariscos German no longer is located at 4949 Santa Monica Avenue, San Diego, CA 92107. 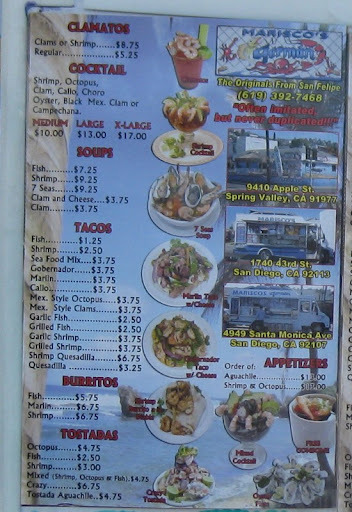 I went by today to buy some fish tacos and sadly to say the truck is no longer there, so then I proceed to called them (619) 392-7468 and I was told that they had to move from the location. This is an injustice. We say we leave in America a land of opportunities and I ask myself for whom obviously not for the poor only for the wealthy.